This is another post that God put so strongly on my heart to share that I'm up at 1am to write about it. You can read the first one I wrote at 1am a few weeks ago about social media here. Before I share the heart of what I feel God wants me to share I need to tell you a little more about our family. Our family is what some would consider "crunchy" or very wellness, whole body minded. My husband, Matt, is a chiropractor, I am a group fitness instructor, we both have our Bachelor's degree in Exercise Physiology and Matt has done more trainings and certifications on wellness than I can count. We could both write for days on the benefits and importance of taking care of your body through the foods you eat(and shouldn't eat), exercise, chiropractic care, vitamins, fish oil, probiotics and so much more. We try our best to avoid dairy, gluten, wheat and soy and even buy organic produce through Bountiful Baskets each week. To say we are passionate about wellness and taking care of the body God has given us would be an understatement. There are fewer things that bring us more joy than helping others be healthy and whole so they can live a long and enjoyable life. Believe me when I say that it is very important to me that my kids learn healthy habits for their bodies because it says in the word that our bodies are temples of the holy spirit. We need to take care of them so that He may dwell in us and bring glory to Him. However, it can't stop there. We must be bold and teach them that being physically fit is just the beginning. We must teach them that being spiritually fit is what will sustain them in this life and the life to come. My kids will eventually age and they will eventually die. The question is will they ever come to know Jesus and give their heart and life to him? Will they see the need to submit to the Holy Spirit on a daily basis or will they be so consumed with their physical well-being that they silence Him? According to this scripture in James 1:15 the most lethal killer we need to worry about is sin. Sin is a silent killer because it can creep into our lives without us noticing it and before long it has taken over our hearts, minds, bodies, spirits and families. It is more lethal and deadly than drinking Draino straight out of the bottle. At least with the Draino we know it is an emergency and we call 911. Sin is much more subtle and will strangle us slowly over time if we don't renew our hearts and minds daily. I believe it is time that we challenge ourselves spiritually the same way we do physically. 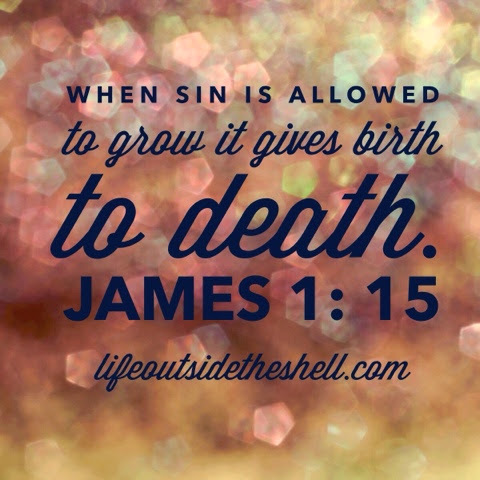 As this scripture from James 1:15 says we will give birth to death if sin is not brought under control and submitted to God on a daily basis. We do that by praying, worshiping, staying in the word and allowing the Holy Spirit into every part of our lives. As we do this for ourselves, our kids and anyone else around us will be changed and challenged spiritually as well. I pray that this causes you to stop and evaluate what message you are sending your kids or anyone else in your life today. My prayer for my family is that our passion for God and His word will far outweigh the passion we have for being physically fit. This body will pass away but the legacy that can be left by being a family who is spiritually fit will last forever. Hi Rachael. I was going through some of the posts on the link-up at the Declare page and I found you. I took some time to read your post twice and I have to say that I wholeheartedly agree. Not long ago I started seeing a doctor that focuses on integrative medicine and he has been helping me improve my lifestyle by using probiotics, eliminating gluten/dairy/wheat/soy, following the autoimmune protocol (for the most part) and many other helpful changes. I've implemented a few of these same practices into our family to keep their health on track, as well. It's been 7 months and I'm feeling amazing! However, during that time I focused so hard on the lifestyle change that I didn't realize how my time in the Word was slipping...a bit here and a bit there. In June I really felt the impact of it and took some time to evaluate where I'd come. My husband and I are now trying to implement a good balance of spiritual health (first) and physical health (second) for ourselves and our four children. We can so easily go over-the-top reading and trying to improve every square inch of our physical lives when I know that, ultimately, my Creator is in charge of it all. And I want my children to realize that at a young age. I remember the words of Priscilla Shirer when she says "Every good thing is not necessarily a God thing." And I believe that. I know there is so much good I can focus on...but in the end, He has to be my main focus. And the rest will follow at the leading of His Spirit. Thank you for sharing Jennifer! I had the same experience in our family when we first learned how to eat and take care of ourselves better. 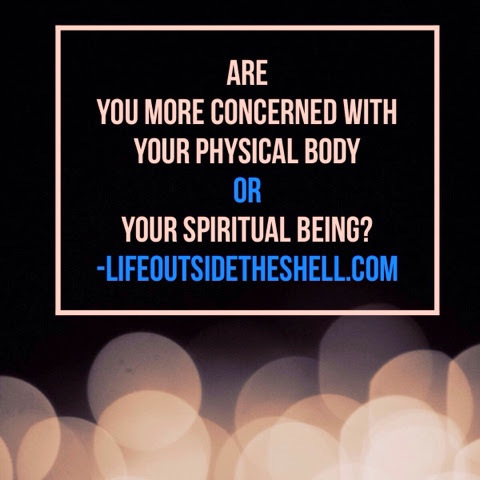 I think we got so excited about the physical changes we saw that we stopped focusing so much on our spiritual side. I look forward to meeting you also!